Last week concluded the 2013 Festival of Homiletics; I blogged about first half of the Festival here and now, I’d like to wrap up the Fesitval. As an introvert, I am spending much-needed alone time today processing through my notes from challenging sermons and lectures. Here I will give a summary of the lectures and sermons; I hope to sit with much of what I learned, continuing to elaborate on it with further future posts. I know that something in me changed during this week and now I begin the hard work of figuring out what that exactly means. On Wednesday, Will Willemon (Professor of the Practice of Christian Ministry at Duke Divinity and Bishop in the United Methodist Church) spoke on our God who is in constant motion, who is relentlessly self-revealing. Willemon focused on the idea that Jesus never really grew up, never matured into the calmer, more middle-aged man who would have been more king-like. How come he couldn’t settle into the God the Jews were expecting? He was a futurist, who balked at tradition, and was criticized for not keeping the Sabbath. Radically different, he continually pushed the envelope and in him the fullness of God was pleased to dwell. Thursday, Rev. 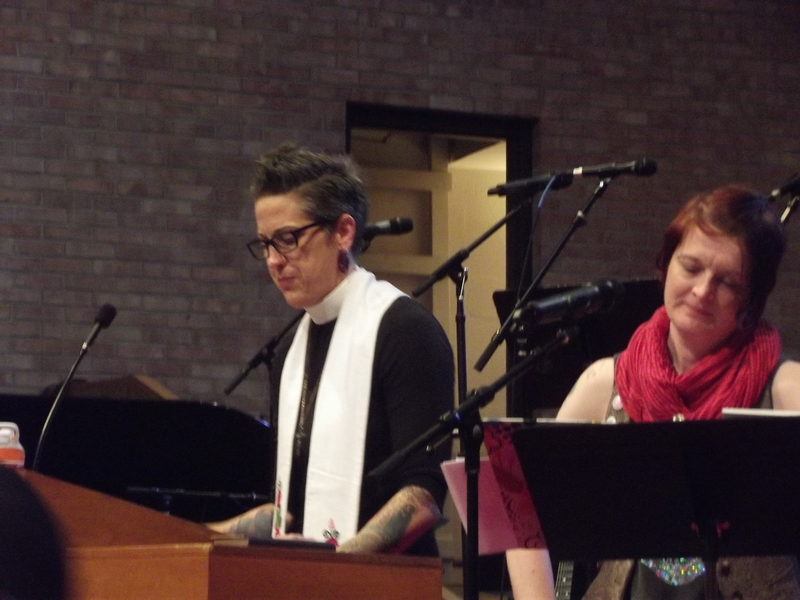 Nadia Bolz-Weber (Founding ELCA Pastor of House for All Sinners and Saints, Denver, CO) led us in a healing service that I will not soon forget. 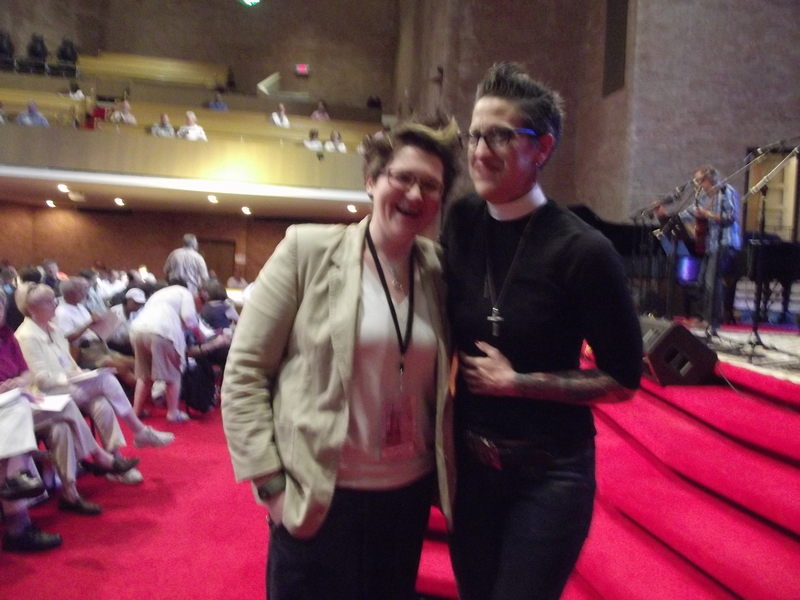 Out of all the preachers who led us at the Festival, I was most excited to sit under Nadia. Heavily tattooed and quite tall, she does not necessarily come across as a Lutheran pastor, but a pastor she is, and a very, very Lutheran one. She led us through confession and absolution, then sang “Come, Thou Fount of Every Blessing” with us, then onto the Gospel Acclamation from Mark 7:31-37. Rev. Nadia began with discussing the fact that at one time in history, Martha’s Vineyard was a bi-lingual community due to the fact that 25% of its residents were hearing impaired. Deafness was viewed as a trait and not a disability. In the Gospel text, the deaf man’s friends brought him to Jesus to be healed, but the text says nothing about if the deaf man actually wanted to be healed. His friends obviously thought he was broken, but what if he viewed his deafness as a trait, like blond hair or hazel eyes, and not an impairment? If Jesus had shown up at Martha’s Vineyard, would the collective “they” have brought Jesus this deaf man to heal? Probably not. She then suggested that we often are quick to recognize and want to fix the brokenness in others, so that we don’t have to see it in ourselves. We are never ourselves, the broken people. Until Jesus shows up. Jesus took the deaf man away from the crowd; he removed the man from the “well, non-broken” people; Jesus put his fingers in the man’s ears and touched his tongue. Then he sighed, probably exhausted from the nonsense of seemingly perfect and unbroken people, then said: “be opened.” That’s all he said. Be opened. And the man could hear. Maybe spiritual healing has more to do with being opened than being cured. Be opened to the idea that your value isn’t in working 60 hours a week for people who might not even be paying attention. Be opened to knowing that your own brokenness doesn’t need to be hidden behind someone else’s brokenness. Be opened to the idea that you are stronger than you think. Be opened to the idea that you aren’t as strong as you think. Be opened to this whole Gospel of Jesus Christ thing actually, actually, actually being real. And actually being FOR YOU. Because maybe that’s what healing really is. You can read her entire sermon here. I highly recommend it. After she concluded her sermon, she gave a lecture later that day. Her lecture was geared towards advice and encouragement for the many clergy present. She spoke about how when she writes a sermon, it is always after she has been wrestling with the gospel text of that week, and how she almost always walks away with a limp. She will not walk away from the text until she has demanded a blessing for her people. It is a costly thing to be a pastor. Saying one of the most profound statements I’ve ever heard, she said: “I try to preach from my scars and not my wounds.” Can we all not take a lesson from this? 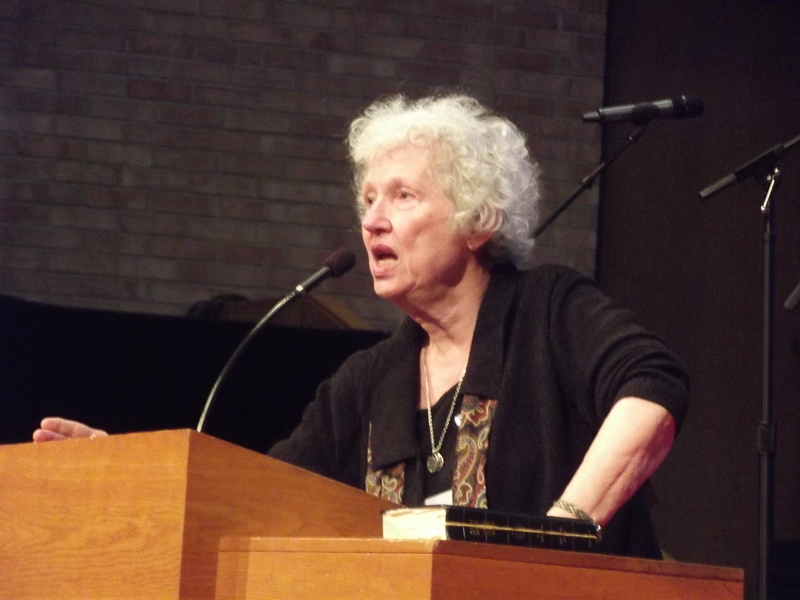 Then came the 82 year old Phyllis Tickle (popular author, editor, and professor) . She began her lecture showing us the temporary tattoo Nadia had given her that morning. 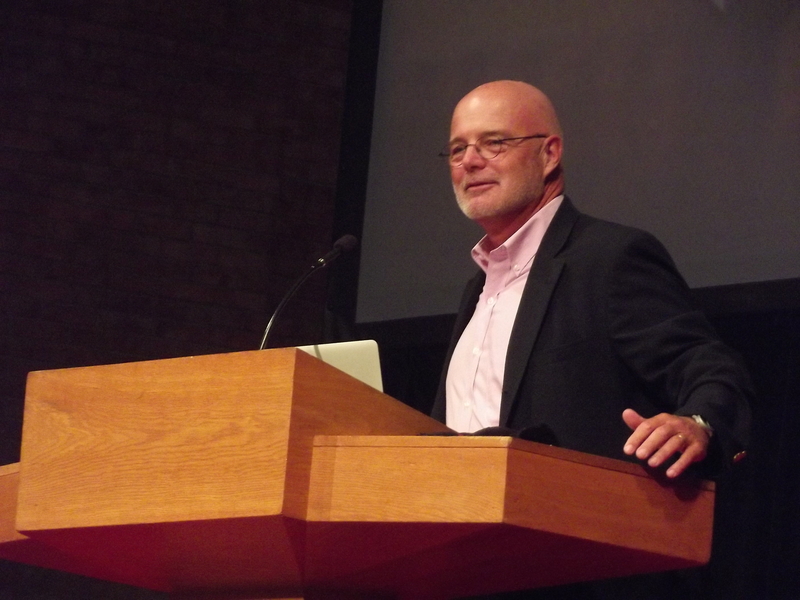 She essentially gave us an interim report on Emergence Christianity and set the stage for our modern-day Martin Luther to speak, Brian McLaren. Phyllis didn’t need any notes. 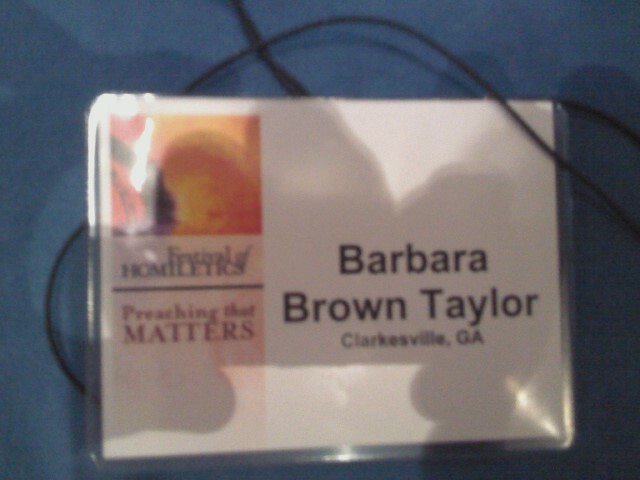 She was full of information, of rich Church history, and she was as snarky as always. She has recently announced her retirement and so, she let us know that she no longer has a filter because she’s no longer worried about employment. Her talk was amazing and I can’t begin to do it justice here. I’ll briefly say that she spoke on the shift that is occurring in the church today and likened it to the Protestant Reformation led by Martin Luther, as the Protestant church was formed as a break off from Catholicism. The Emergent Church is the same to Protestantism as Protestantism was to the Roman Catholic Church 500 years ago. God is doing a new thing among us and it will look much different than the church you and I grew up in and around. Sola Scriptura (Scripture alone), she said, is indeed dead. The canon is being reconsidered. I have ordered her book, so expect more blog posts about this. Is it possible to rebuild a Christian faith, identity, and ethos without hostility to the other? We’ll discuss this in detail in future posts and you are welcome to discuss it here in the comments. I am grateful for this Festival from which I was greatly encouraged, but also heard some uncomfortable teachings. I am learning to sit with the hard things and let the Spirit change me.